Delta again earned strong marks in September for its cancellation rate, on-time arrivals and baggage handling for U.S. domestic mainline flights, according to the U.S. Department of Transportation. Delta canceled less than one one-hundredth of a percent of its domestic mainline schedule during September. Delta had just seven mainline domestic cancelations during the month, resulting in a 99.99 percent "completion factor." Baggage performance finished among the industry’s best. A rate of 1.51 complaints per 100,000 customers exceeded 10 of the 13 DOT-reporting carriers. On-time arrivals finished above 90 percent. Delta’s domestic mainline arrivals with 14 minutes of schedule clocked in at 90.5 percent, number one of the 13 DOT-reporting carriers. The airline has excelled all year on most operational measures. Last month, employees finished a day with no canceled flights for the 100th time in the 2015 calendar year, a feat never before accomplished in aviation. And that was with more than three months to go in the year. Delta employees earn monthly bonuses based on these metrics if goals are met or exceeded. Delta employees will each earn $100 for the September results. 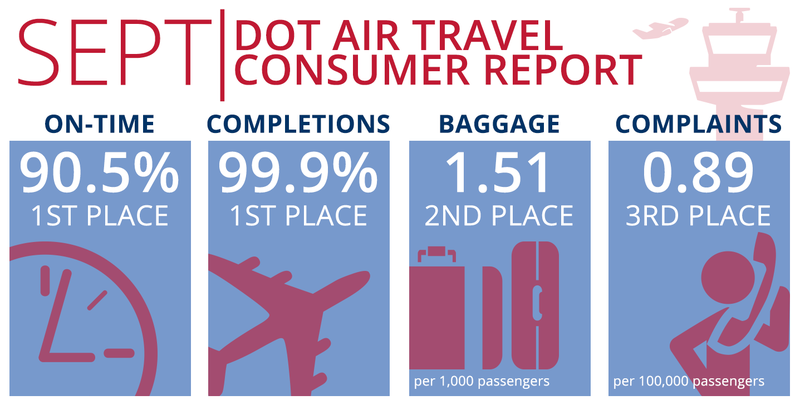 The November 2015 Air Travel Consumer Report includes statistics for September 2015 based on domestic flights flown, completion rate based on domestic flights scheduled, and mishandled bags per 100,000 enplanements for domestic flights scheduled compared to all carriers reporting to the DOT. Earlier this year, Delta introduced its Operational Performance Commitment —an industry first—that will compensate its corporate customers should Delta’s operational reliability fall below two of its major competitors. 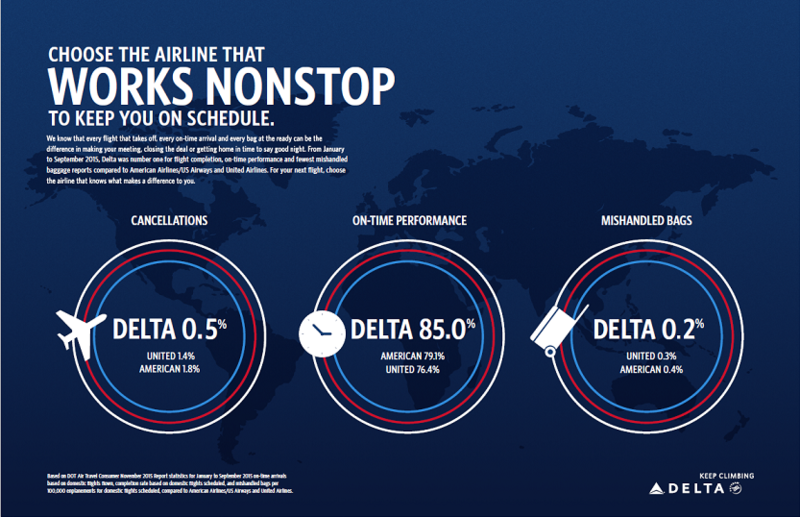 The Operational Performance Commitment provides remuneration to select corporate customers in good standing in the event that Delta Air Lines’ domestic mainline operational performance is not as good as the respective domestic mainline operational performances of American Airlines and United Airlines as measured over a calendar year.